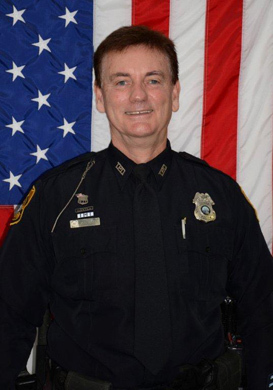 Reserve Officer Michael Quill retired from the Gulf Port Police Department with the rank of Lieutenant in 2001 and has been a member of TPD’s Reserve Force since October 2005. Reserve Officer Quill has has volunteered over 2,500 hours all over the city including co-sponsored city events. During 2014, Reserve Officer Quill received three letters of appreciation from business leaders and officers for his “outstanding” perfomance and dedication. In one instance, Quill was working an assignment at the Jan Platt Library when he discovered that students frequenting the library after school were not closely monitiored, as they would move in and out of the building and congregate near the street while waiting for parents to pick them up. He recognized a potential danger with this lack of supervision and arranged for a dedicated study room at the library to house the students while they waited for pick up. Reserve Officer Quill regularly donates his hours to help with the “Homeless Initiative.” On November 11, 2014, Officer Quill volunteered his time with “Operation Reveille.” He provided building security for this event in which 50 homeless veterans were able to get off the streets and into permanent housing in a single day. Officer Quill also assisted with transporting 11 disabled veterans at various locations throughout the city to ensure that they would benefit from this wonderful opportunity on Veteran’s Day. Reserve Officer Michael Quill is well respected by his fellow officers. His leadership, dedication and commitment to the reserve force and TPD is an amazing privledge.